It's been a tense day all over. The city boldly decided to continue to run the ING NYC Marathon. A few minutes ago they decided to cancel it. (Or perhaps postpone, it's unclear at this time.) Diverting resources for the race that are so desperately needed in devastated regions just wasn't right. While I feel terrible for the folks who are losing money and training time and other things because of this I hope they'll understand. Lizz Winstead is already promising a show for the runners when the race is rescheduled and lots of cheering. The cheering here for the marathon is so intense all along the route. I just know that, no matter when they are able to schedule the race (even if that means this time next year) everyone who runs will be overwhelmed by the support they get. For now I just hope that, in the wake of losses in time, effort, and money, the NY Road Runners Club can see their way clear to redistribute the resources they have in place to people in need. I don't have confirmation of this but a friend reported today that displaced people on Staten Island were being turned away from using the portable toilets at the starting line for the marathon. That's just inhumane and ridiculous. Staten Island Recovers is a community powered recovery resource. People can log on to request help or to give it. There's a similar site, Red Hook Recovers, for the section of Brooklyn I mentioned yesterday. I'm just hearing that there was enough damage in Astoria, Queens to warrant a site as well. The Lower East Side of Manhattan has a site on Recovers.org as well. They were lucky enough to get power restored today for the most part. Thank you to everyone who has been donating and working to make things better here and sending us light, love and hope. Like I said, it's been a tense day and things aren't going to get much better until we get the power and heat back on and people safely back in their homes. I'd write more but I have to run downstairs and get the laundry I'm doing so a friend can have clean clothes to wear as she cleans her Manhattan business again tomorrow. 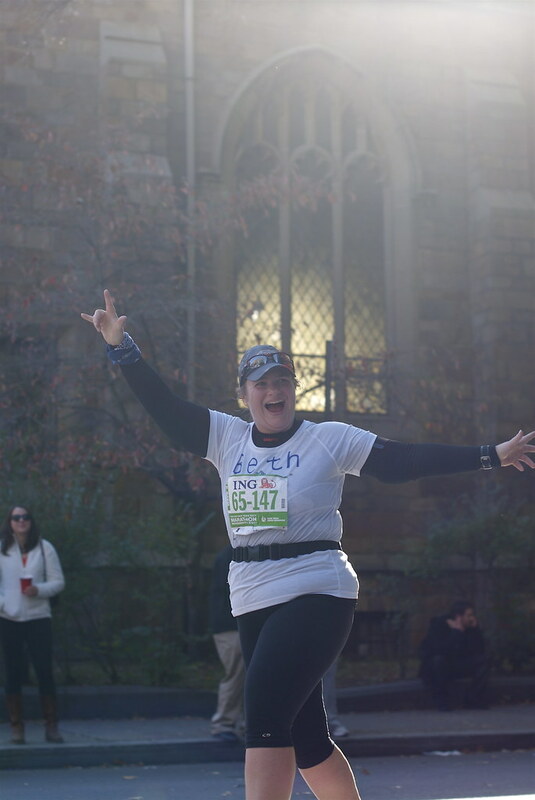 *Photo is of my friend, Beth, who ran the marathon last year and this year is mobilizing donations for Staten Island hurricane victims.